County D.A. Sim Gill made the announcement; the officer's attorney calls the decision to prosecute "politically motivated." 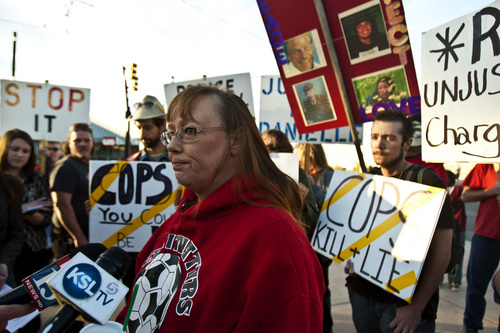 Chris Detrick | Tribune file photo Melissa Kennedy, mother of Danielle Willard, speaks during a "rally against police violence" outside of West Valley City Hall on the one-year anniversary of Danielle Willard's death in November 2013. Former West Valley City narcotics detective Shaun Cowley has been charged with second-degree felony manslaughter in Willard's shooting death. 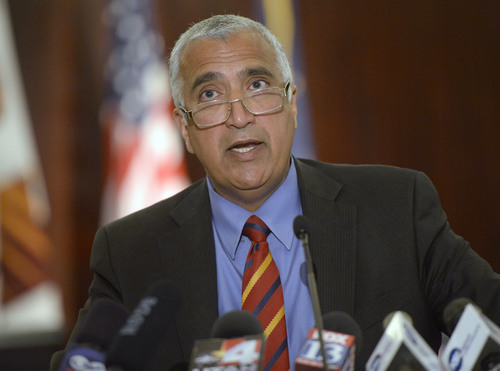 Al Hartmann | The Salt Lake Tribune Salt Lake County District Attorney Sim Gill holds a press conference Thursday June 19, 2014, to announce a manslaughter charge has been filed against former West Valley City police detective Shaun Cowley in the 2012 shooting death of 21-year-old Danielle Willard. Al Hartmann | The Salt Lake Tribune Salt Lake County District Attorney Sim Gill, left, confers with Criminal Division Chiefs Blake Nakamura, right, and Jeff Hall, front, before a press conference to announce a manslaughter charge filed against a former West Valley City police detective in the 2012 shooting death of 21-year-old Danielle Willard Al Hartmann | The Salt Lake Tribune Salt Lake County District Attorney Sim Gill is holds a press conference to announce a manslaughter charge filed against a former West Valley City police detective in the 2012 shooting death of 21-year-old Danielle Willard Danielle Willard Al Hartmann | The Salt Lake Tribune Salt Lake County District Attorney Sim Gill, left, confers with Criminal Division Chiefs Blake Nakamura, right, and Jeff Hall, front, before a press conference to announce a manslaughter charge filed against a former West Valley City police detective in the 2012 shooting death of 21-year-old Danielle Willard Al Hartmann | The Salt Lake Tribune Salt Lake County District Attorney Sim Gill holds a press conference Thursday June 19, 2014, to announce a manslaughter charge has been filed against former West Valley City police detective Shaun Cowley in the 2012 shooting death of 21-year-old Danielle Willard. Al Hartmann | The Salt Lake Tribune Shaun Cowley sits with his defense team during his appeal before the West Valley City Employment Commission Wednesday April 23, 2014. 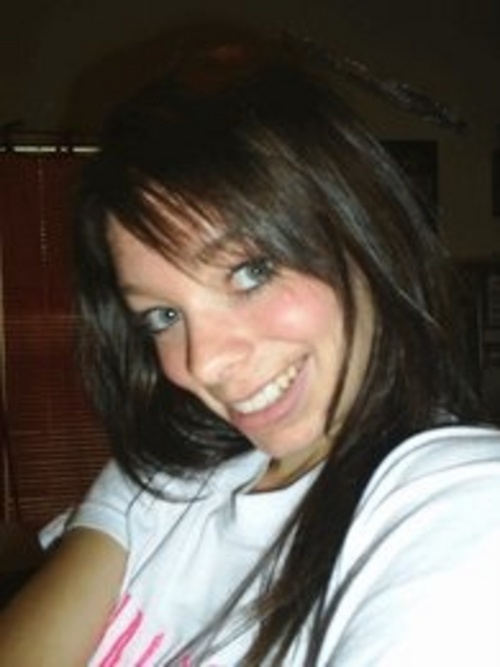 Cowley was fired over shooting and killing Danielle Willard and mishandling evidence. 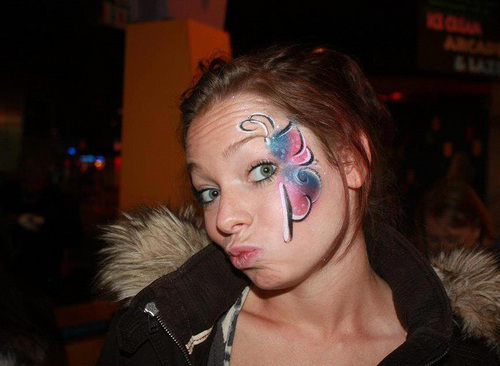 (Courtesy photo) Danielle Willard, 21, was shot and killed Nov. 2, 2012, by West Valley City Police detectives during a drug investigation at an apartment complex. Courtesy photo Danielle Willard, 21, was shot and killed Nov. 2 by West Valley City Police detectives during an investigation at an apartment complex. On March 21, 2013, WVC police identified the two officers who shot Willard. 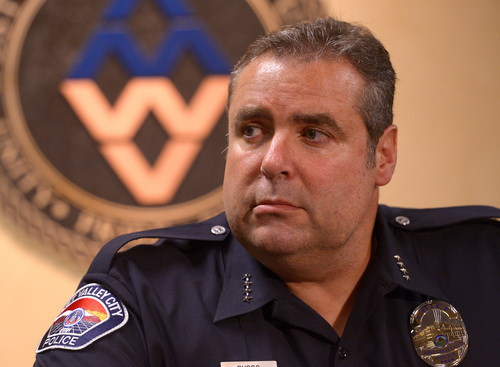 Leah Hogsten | The Salt Lake Tribune West Valley City Police Chief Lee Russo said during a Thursday, June 19, 2014 afternoon press conference that the city is prepared to move forward with the appeal process for former WVC narcotics detective Shaun Cowley. Going forward, Russo said he wants to see how the department can do things better in the wake of the shooting. "We don't want anything like this to happen again," Russo added. Seventeen months after Danielle Willard was shot to death, Salt Lake County District Attorney Sim Gill announced Thursday, he was charging one of the West Valley City detectives with second-degree manslaughter. The charge was filed against former West Valley City narcotics detective Shaun Cowley in 3rd District Court. 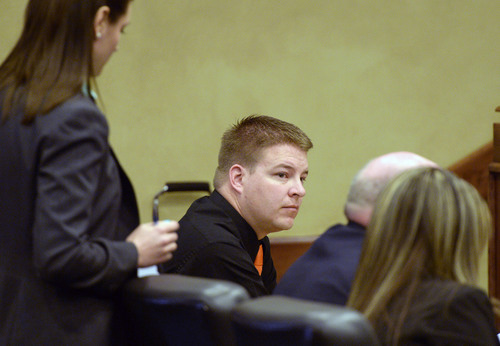 Gill opted not to charge the second detective who fired his weapon at Willard, Kevin Salmon. 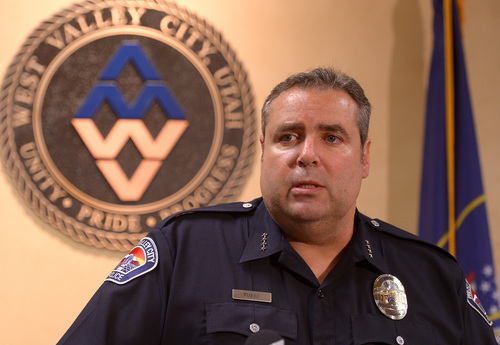 Leah Hogsten | The Salt Lake Tribune In West Valley City, new Police Chief Lee Russo leads an agency that has been singled out in a new Census data survey as one of the least "racially balanced" police departments in the country. In his case, a city where a third of the population is Hispanic in origin, only 6 percent of the police force is. 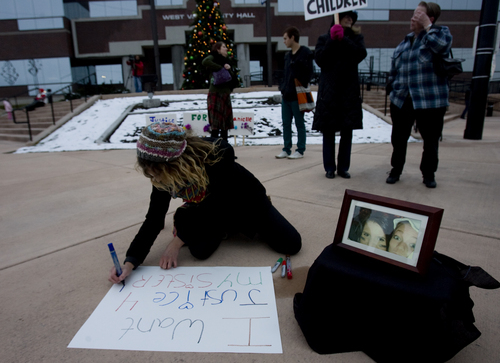 Kim Raff | Tribune file photo Kayleen Willard, sister of Danielle Willard, makes a sign during a Dec. 16, 2012, vigil outside the West Valley City Hall for Danielle Willard, who was shotand killed by West Valley Police on Nov. 2, 2012, as she sat in her car unarmed. Former West Valley City narcotics detective Shaun Cowley has been charged with second-degree felony manslaughter in the shooting death of Danielle Willard. 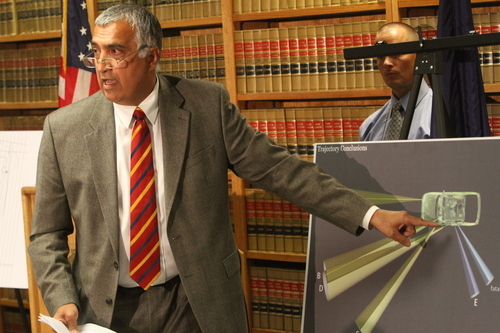 Rick Egan | Tribune file photo In this photo from August 8, 2013, Salt Lake County District Attorney Sim Gill points out the angle of the fatal bullet, while discussing the findings of the investigation into the shooting of Danielle Willard. Mike Powell, of the West Valley Police Department, is on the right. On June 19, 2014, former West Valley City narcotics detective Shaun Cowley was charged with second-degree felony manslaughter in the shooting death of Danielle Willard. Nineteen months after Danielle Willard was shot to death, Salt Lake County District Attorney Sim Gill announced Thursday he had charged one of the West Valley City detectives involved with second-degree felony manslaughter. The charge was filed against former West Valley City narcotics Detective Shaun Cowley in 3rd District Court. However, Gill opted not to charge Kevin Salmon, the other detective who fired his weapon at Willard. Cowley was booked into the Salt Lake County jail on Thursday afternoon, but he soon posted $10,000 bail, according to the jail&apos;s website. Lindsay Jarvis, Cowley&apos;s attorney, called the decision to prosecute "politically motivated." She said in a written statement her client learned that charges had been filed against him while watching a live televised press conference where Gill announced the charges. Cowley then voluntarily surrendered to the jail. "In spite of Sim Gill&apos;s public presentation of manipulated evidence, which was both unethical and prejudicial, we are confident that Detective Cowley will prevail at trial," Jarvis said. 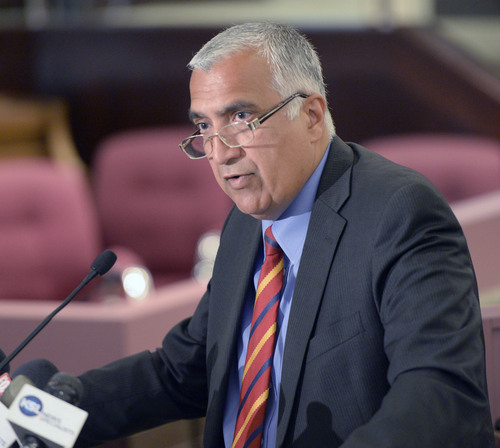 "Sadly, this case has been used as a political platform for Sim Gill to continue his re-election endeavors, as opposed to being analyzed fairly and impartially." Willard&apos;s mother, Melissa Kennedy, said she was pleased with Gill&apos;s decision. "Cowley&apos;s the one that murdered her," Kennedy said. "He&apos;s the one that shot the gun. He&apos;s the one that raised the level of force. "I would have preferred murder" charges, Kennedy added, "but if manslaughter is all we can get, I will be happy with that." 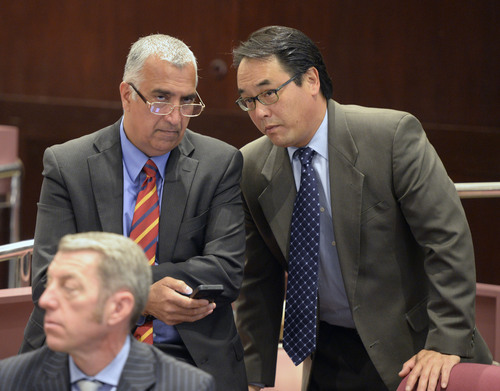 Ian Adams, a spokesman for the Utah chapter of the Fraternal Order of Police, was glad Salmon was not charged, but criticized the count against Cowley and how long it took for Gill to make a decision. He said it took the district attorney almost 600 days to make a determination about officers who had only seconds to make their decisions. 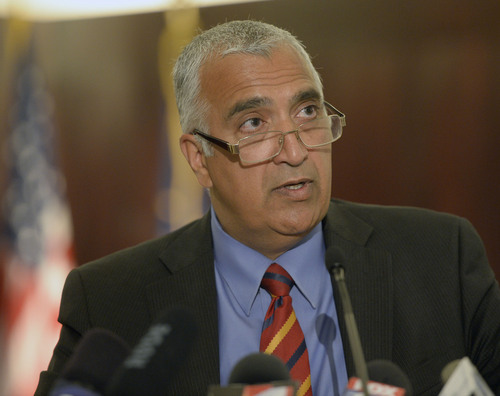 "This is not going to be a successful felony case," Adams said, "not the way it was handled." It is rare in Utah for a police officer to be charged with homicide. The most recent case was a Taylorsville police officer, who was charged with negligent homicide, a class A misdemeanor, for allegedly killing a motorist while attempting to join a police pursuit in February 2007. As part of a deal, the officer pleaded guilty to three lesser traffic violations and was sentenced to a fine and probation. Other than that case, veteran prosecutors could not remember another instance of a Utah police officer being charged with a crime for killing someone. The charge against Cowley ends months of debate about whether criminal counts should be filed and why Gill was taking so long to make a decision. Cowley, 33, and Salmon were conducting a drug investigation in the area of 2290 W. Lexington Park Drive (3710 South), when they shot at and killed Willard, 21, as she backed a car from a parking spot Nov. 2, 2012. Nine months later, Gill announced the shooting was not justified under Utah law, but he waited until Thursday to announce the criminal charge. In the interim, the Willard shooting sparked protests from people who saw it as an example of excessive force by police. The shooting also led to spiraling investigations of the West Valley City Police Department&apos;s neighborhood narcotics unit, resulting in discipline for its detectives and hundreds of criminal cases being dismissed. The longtime police chief, Buzz Nielsen, resigned for what he said were health reasons. Cowley was fired  not for the shooing, but for mishandling evidence found in his car after the shooting. He has been fighting his termination and has an appeal hearing scheduled for Aug. 25 before the city&apos;s civil service commission. Salmon has been on paid leave pending the decision on criminal charges. West Valley City Police Chief Lee Russo said during a Thursday afternoon news conference that the city is prepared to move forward with the appeal process for Cowley. As for Salmon, Russo said now that the district attorney has declined to file charges, the department&apos;s investigation could be completed within 30 days. He said the department has "completed more than 99 percent of that investigation," and the findings could result in changes in training and policy within the department. "We don&apos;t want anything like this to happen again," Russo said. "This is a very good police department," he added, "and people need to know this. Every week I see acts of excellence." 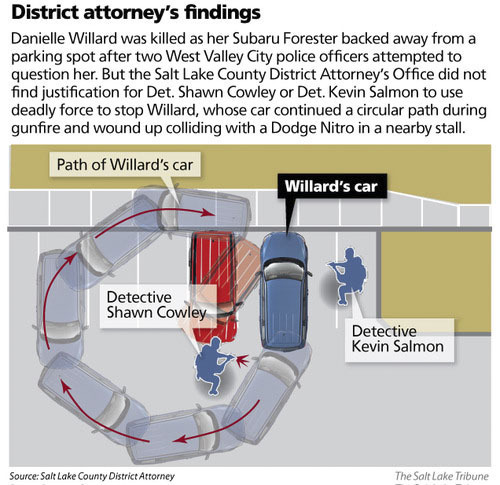 Gill, during his news conference on Thursday morning, focused on how evidence showed Cowley was standing to the side of Willard&apos;s Subaru, and not in the path of it as he claimed, when he fired the first shot, striking Willard in the head. Cowley has claimed the car&apos;s rear bumper struck his right leg. "The evidence supports that [Cowley&apos;s] life was not in danger," Gill said. When asked why Cowley was charged with manslaughter rather than a harsher charge of murder, Gill said the charge was based on the "recklessness of the conduct." If convicted as charged, Cowley could be sent to prison for up to 15 years. The Subaru did brush Salmon&apos;s leg, according to Gill. Also, because Salmon fired his gun after Cowley began firing, Salmon could argue that he was following another detective&apos;s lead. Plus, none of Salmon&apos;s bullets struck Willard. Investigators found six shell casings at the scene. Gill on Thursday gave a list of law enforcement agencies that participated in a task force, including the Salt Lake City and Unified police departments, that made recommendations to Gill&apos;s office about the shooting. Gill said the last expert to review the case came to his office just 1½ weeks ago. It&apos;s not clear that Gill, a Democrat who is running for re-election in November, wanted to file charges directly. City Weekly reported in January that Gill&apos;s office had sought a grand jury to consider whether criminal charges should be filed against Cowley and Salmon. But a panel of five state court judges that hears requests to convene such grand juries refused the request, according to court records. Gill declined Thursday to discuss any efforts to convene a grand jury. "Nothing about this investigation has been ordinary," Gill said. "We wanted to be thorough, we wanted to be deliberate in the process." 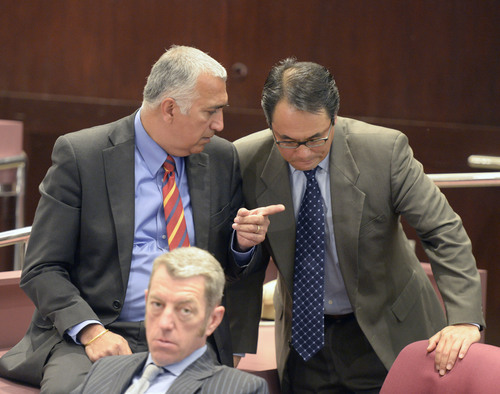 Gill  with Davis County Attorney Troy Rawlings  is also leading another high-profile criminal investigation, this one of former Utah Attorneys General John Swallow and Mark Shurtleff.